Calliandra haematocephala is one of those great plants that can rarely be found in the nurseries but can often be found in older gardens. Calliandra haematocephala alba is even harder to find in an older landscape than the Pink Powder Puff. When I can find it I use the White Powder Puff as a espaliered hedge or as a specimen shrub. Calliandra haematocephala alba will thrive in full sun and still bloom in a half shaded location as well. I find the White Powderpuff to be easily shaped into a loose hedge to maintain with my hand pruners. I trim them back a couple of times each year. The White Powderpuff provides a great show when you observe the plants closely and with its white flowers can draw you in from afar. This plant sure is a lot nicer to look at than a stucco or cinderblock wall. Calliandra haematocephala alba can be damaged with temperatures in the high 20° F. I use the White Powderpuff in coastal gardens and in protected inland locations. Calliandra haematocephala alba can thrive in all kinds of soil but does poorly in continuously wet conditions. 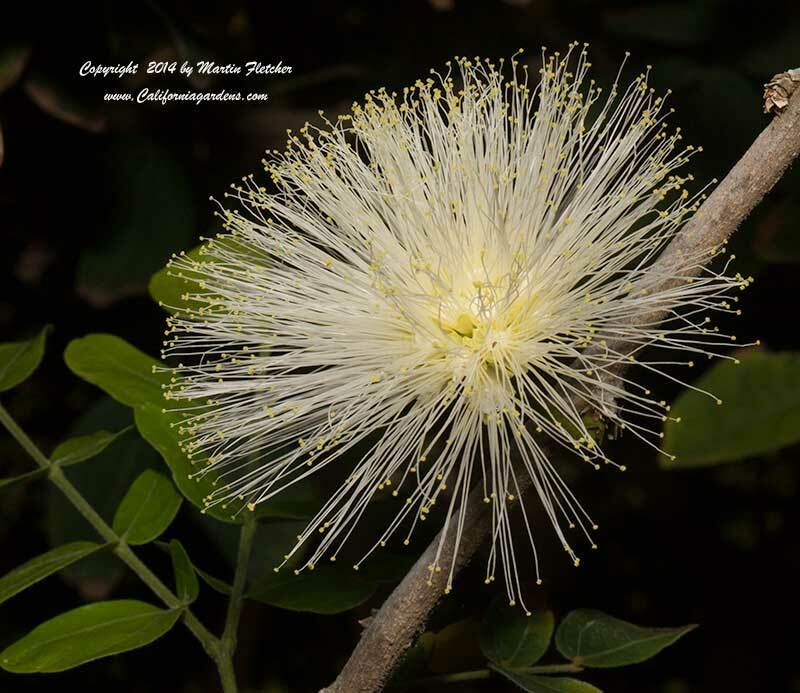 Flowers and foliage of Calliandra haematocephala alba the White Powder Puff . High resolution photos are part of our garden image collection.